I find the dull metallic hum, as the train pulls away from the harsh glow of neon lights on the station platform, somewhat comforting in its reassurance. As is entering the dark cavern of the subway tunnel whilst cocooned in the dim warmth of the vibrating carriage. Once again the familiar tempo of steel wheels upon the rails, and the irregular rocking as the train rumbles along, calms the customary angst which always seemed too accompany me in hectic, overcrowded places. Seated comfortably, time slows. Harmony descends upon me like a cloak of serene velvet. I sigh out loudly, a liberated wisp of disquiet flutters away, disappearing into the ether. Unbuttoning my coat and flicking the hood from my head, I leaned back stretching my weary legs out in front of me. 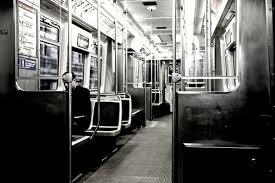 The carriage is empty. I am alone. Peace and calm descend. At this time of night the subway takes on a different form, its very structure becomes prominent. Vibrations resound in every wall, wafts of cool air frequently gust throughout; inhale, exhale, the subway breathes deeply. Recurrent metallic taps echo from the depths of the black underpasses in harmony with those rustling organic whispers. It is as if the subway comes to life, wakens as an entity in itself. I love the subway at this time of night, which is why I like to take the late train home. I can relax. I like to stare through the glass, trying to make out what the indistinct passing shapes that flash by actually are. Long, thick wires twist together, hanging in sooty swags from the tunnel walls, like massive black anacondas awaiting unsuspecting prey. The occasional light, dulled by a layer of caked on grime, giant fireflies? And dark recesses, small arches sunken into the curvature of the walls. What lays within? Possibly a door, a secrete door to another world, a parallel universe? Then there is the reflection, my reflection, eerily unfocused, staring back at me from the darkened window pane. But is that me? I think not. Looking I see the reflection has a smirk on his face, he is hiding his knowledge of me, or a secret. He has the answers I seek. The answers I have spent my whole life trying to find. He smiles before fading away as the train enters a brightly lit station. These are my fantasies, my late night daydreams as I travel home. This is where my reality and illusion merge, where imagination and invention combine. This is the birthplace of whimsy and caprice. This is why I like to take the late train home.